Gov. Tom Wolf (D) proposed a four-year $4.5 billion infrastructure spending plan for Pennsylvania on Jan. 31 that includes funding for local road upgrades, new “flexible funding” options for businesses that need local infrastructure upgrades, plus monies for multimodal and large-scale transit capital projects – all paid for by a new “severance tax” on natural gas production. Meantime, the state approved 50 highway, bridge, transit, aviation, and bike and pedestrian projects in 23 counties to share a total of $44.5 million in funding through its Multimodal Transportation Fund. Gov. 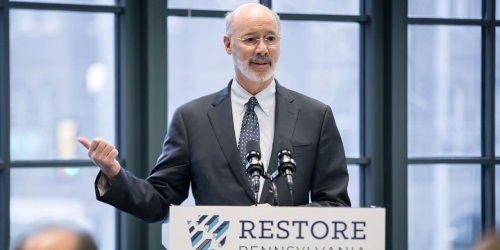 Wolf said his new infrastructure initiative – entitled Restore Pennsylvania – will focus on five areas: providing more high-speed internet access statewide; improving storm preparedness and disaster recovery programs; supporting infrastructure needs for manufacturing, business development, and the energy sector; addressing residential and commercial property “blight” and brownfield clean-up needs; plus, funding an array of transportation projects. He added that the “severance tax” funding this plan will be tied to natural gas profitability; as producer profitability increases due to rising natural gas prices, the severance tax rate will increase as well. He emphasized that “transportation is critical to connecting communities and economies, and we are an important partner in bringing progress across the state,” which is the reason behind the recent $44.5 million in multimodal funding grants the state made on Feb. 1.